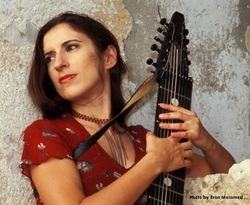 Irene Orleansky is a singer, Chapman Stick player, producer, film director and ethnographer from Israel. Her debut album Live The Music presented her skills as a singer, musician and song-maker. Though her voice and Stick can be heard throughout the CD, in her new album Music of Israelites and Jews of Africa and Asia, Irene acts primarily as a producer. Trotting through Asia and Africa with her mobile studio, Irene visited nine Hebrew communities in seven countries to explore their music and do recordings on the field. The original purpose of Irene’s project was to show the listeners the diversity of Jewish music and culture. However during her visits, she saw hardship, poverty and discrimination that many of the Jewish communities in Africa and Asia encounter in their daily lives, and decided to turn it into a charity project to raise funds to support those communities in need. Irene has just released her debut documentary film "Bal Ej: the hidden Jews of Ethiopia." The upcoming screenings of the film "Bal Ej: the hidden Jews of Ethiopia"
About the documentary film of Irene Orleansky "Bal Ej: the hidden Jews of Ethiopia" . The result of Irene's two year journey through Africa and Asia, the album features about 100 musicians from 11 countries, including such renowned guest artists as Jerry Marotta, Tony Levin, Virginia Splendore and Don Schiff. The last copies of the debut album of Irene Orleansky almost totally recorded on the Chapman Stick, a ten string electric tapping instrument. Featuring artists: Kirill Malahov, Guillermo Cides, dj Asi Kojak. Watch a music video of the song "Shalom, Mirembe!" from the new CD. Filmed in Uganda by Hannah Nemer. Ata Adonai Avinu a song from the album "Music of Israelites and Jews of Africa and Asia" recorded with the Bnei Ephraim community of India on the ad of Asian Jewish Life magazine.